The following article was first published on 6 September 2007. With the talk of “reform” and “change” in the PAP government following the 2011 General Election, we feel it is timely to re-post this article for discussion. “Singapore‘s political and social climate needs to give space for more ventilation and variation. Singaporeans who took then-PM Goh’s words to heart and tried to “fulfill their aspirations” would have found out that the words spoken by our government ministers don’t necessarily sync with the reality on the ground. When the Remaking Singapore Committee was formed in Feb 2002, led by Dr Vivian Balakrishnan with “about 100 people on the sub-committees” (link) , there was great expectation. The media was like a circus, feverish in its coverage of what ministers were saying, trumpeting the beginning of a new dawn. 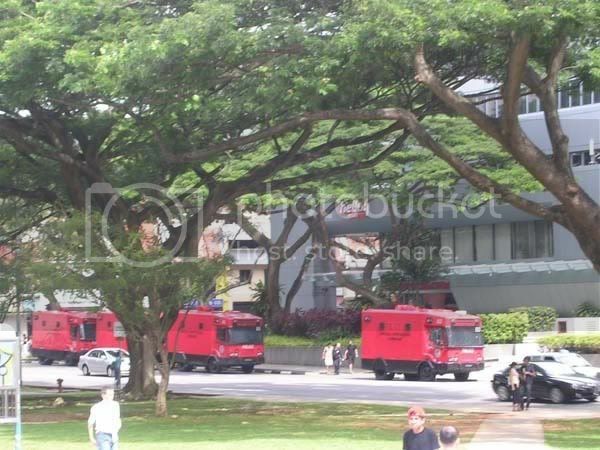 The government was going to open up spaces, sacred cows would be slaughtered, Singaporeans were urged to “just do it”. Expectations were of a Singapore finally coming of age – politically, socially, as a nation. Indeed, many encouraging statements were made by government ministers – painting a picture of a Singapore which is more open, vibrant and inclusive. A City Of Possibilities! “Engage your ideals!”, cried prime minister Lee Hsien Loong only 3 years ago. “Just do it! Nike says Just Do It!… Find your own leaders! Organise your own solutions, move!”, he admonished Singaporeans. What has taken place, however, is contradictory to what the ministers have said – especially in the civil society and political sphere, and this has been proven in very recent events too. Despite then-prime minister Goh Chok Tong saying that “it no longer makes sense for the Government to always control and regulate every activity”, the opposite is true. The government’s idea of opening up more spaces, alas, seemed to only apply to The Speakers Corner where PM Lee wanted a “hundred flowers to bloom”, allowing a stripshow from Paris and more recently, casinos and F1 races. If The Workers’ Party’s application to hold a cycling event isn’t even allowed, then all talk and promises of “Singapore’s political and social climate” being given more space is just that – empty talk and hollow promises. The sacred cows are still fenced up behind those electric fences. Untouchable. 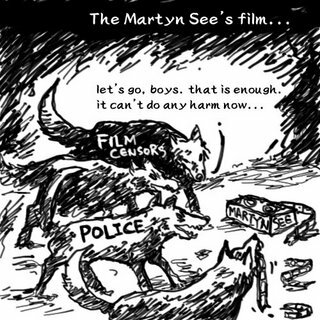 The litany of recent bans and disallowed events speaks for itself. One would by now be familiar with the ban on the picnic and the jogging activity which People Like Us wanted to hold, the ban on Martyn See’s films, the termination of Alfian Saat’s employment at a secondary school without any explanation, the rejection of a permit for The Workers’ Party to hold a cycling event, the rejection of Alex Au’s application for a foreign speaker to speak at a seminar, the rejection of the Singapore Democratic Party’s application for members of the CALD to speak at a public forum, the rejection of Alex Au’s application to hold a photo exhibition, a story telling event by Ng Yi Sheng was banned, and more recently, police were sent to stop a small group of Singaporeans protesting against the anime distributor Odex. The list goes on. On occasions, these citizen initiatives were met with a number of buses of riot police, with truncheons and full riot gear. The saddest thing about all these rejections and bans is that obscure, nonsensical and poor excuses/reasons are given. Hypotheticals. Imagination. Machinations of a paranoid State. Along with the sacred cows come sacred excuses – excuses which are so full of holes you can drive a 3-tonner right through it. “Not in the public interest” is a favourite one with the authorities. “Contrary to public interest” comes in second. If these do not suffice, then threats to “public order” or “potential public disturbance” are offered. Of course, the authorities will also throw in the “permit is required” cliche. That always clinches it. If it doesn’t, there is always the terrorism bogeyman since 911. Electric fences jolts you back into reality before you get too carried away with wanting to be a part of an “active citizenry” and get too close to the electric fences which protect the “sacred cows” of “no public assembly” and “public order”. To ridicule or ignore the reasons or excuses given by the authorities would be to underestimate the serious consequences which would result – especially when we want to be a nation where citizens feel a sense of belonging, of identity and nationhood. The rejected or banned events may be small or even insignificant by themselves, but taken as a whole such denial sets the tone for all of society. People become disinterested, cowed, afraid even. They withdraw into the predictable paths laid out by the State – work, pay your bills, be happy. Don’t try and do anything for yourself. And this is where the government should and must realize that a brush-off has consequences which stifle the activism, involvement and participation of citizens. Ultimately, it creates disenchantment and disenfranchisement among Singaporeans. Why would anyone feel that they belong to a place which bears no identity to what he or she believes in? It is rather curious to see government agencies (with participation from government ministers and PAP MPs) taking part in very public mass activities. 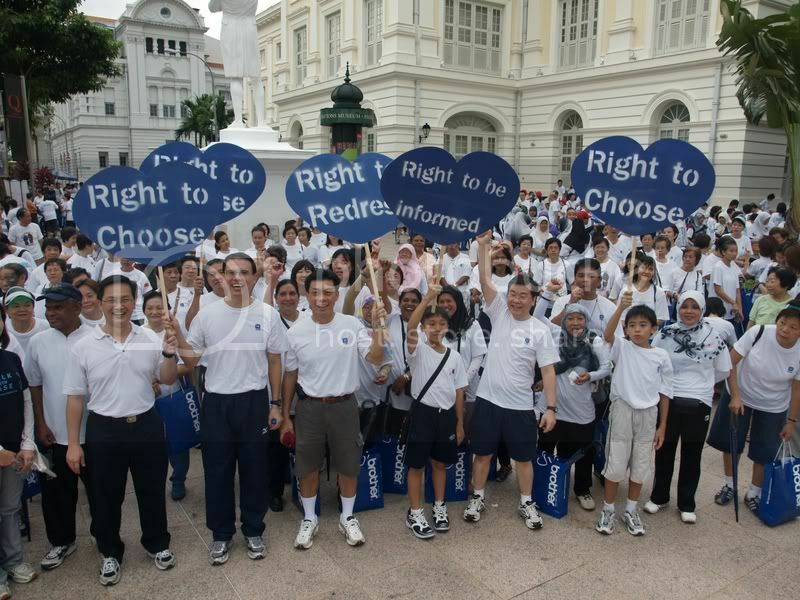 For example, the Consumer Association Of Singapore (CASE) held a “Walk With CASE” not too long ago, as proudly reported on its website. Weren’t the police concerned about “public disorder” or “public disturbance”? If only events organized by the government – or the PAP – are given the green light, then Singapore will be nothing more than just a one-dimensional city, with a one-track mind, so to speak. Fluff City – skyscrapers and F1 races or not. 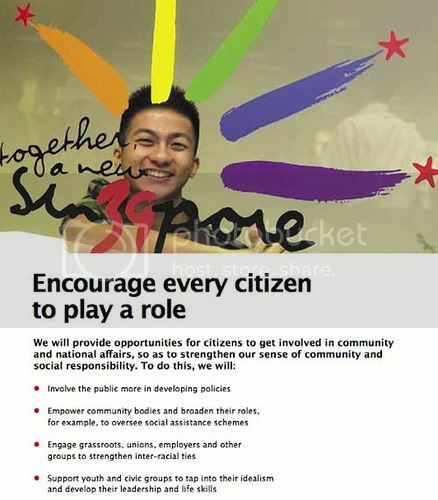 The very diversity which the Remaking Singapore initiative was supposed to encourage is sacrificed at the altar of conformity and uniformity – or if you like, blandness. The new rallying cry of a “City Of Possibilities” follows “Remaking Singapore” in 2002. One can only hope that this new and latest initiative will see more substance and that the government will put its money where its mouth is. That A City Of Possibilities means that citizens are the ones who initiate participation – and not just the government. 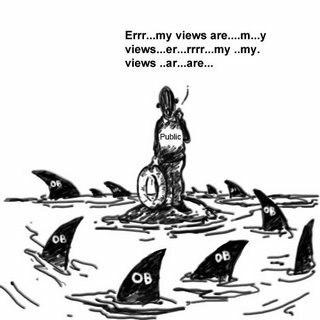 The government must stop behaving like a political party which puts its own self-interest and survival above that of Singapore and Singaporeans. For is this not the fundamental reason why so many events – especially the political ones – have been disallowed? And this curtailing of civil society – which, essentially, means citizens doing things for themselves – will result in an uninteresting, uninspiring society. She called on the government to let mavericks and “troublemakers” play their roles, as they give society a certain rambunctiousness. That kind of environment, she noted, nurtured a leader like Minister Mentor Lee Kuan Yew. It is time for the government to stop making meaningless statements which bear no resemblance to the reality being implemented on the ground. If they do not mean what they say, they should not say it at all. But if they do say it, let their words be backed up with changes to legislation – the Penal Code, for example – so that everyone is certain that the government is committed to its declarations and, more importantly, citizens are unequivocally and unambiguously protected by the law. Perhaps it is time to stop protecting the sacred cows with those barbed wire and electric fences. Nah, not perhaps. It is time to do so, especially when our senior government ministers keep making public statements such as the ones below.They only serve to show up the emptiness of their words. It is truly unbecoming for a government which regularly trumpets its own integrity. “The reason why the US got into the predominant position (in the world economy) is because it was prepared to allow a whole host of citizens to try, experiment, to do it yourself.” – SM Lee Kuan Yew, Asian Wall Street Journal, June 19 2001.